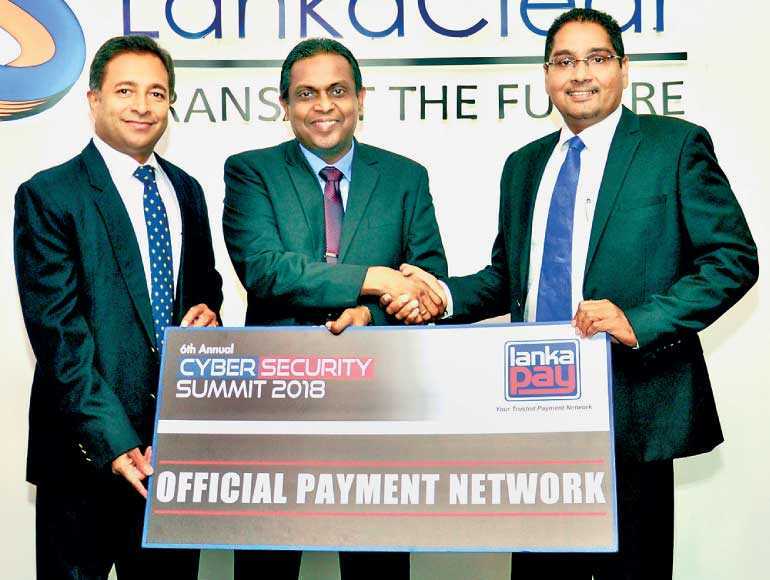 For the fourth consecutive year, LankaPay– Sri Lanka’s National Payment Network, is partnering with annual Cyber Security Summit 2018 edition as the Official Payment Network. The summit to be held on 19 and 20September at Cinnamon Grand Hotel consists of three key events: The CEOs’ Forum on Cyber Security on 19th and Cyber Security Day Conference and Hangout with Hackers (Night Hack) – an innovative and informative evening on 27th. The summit is co-organised by CICRA, Sri Lanka’s pioneering cyber security training and consultancy organisation and Daily FT, country’s only business and finance newspaper. Speaking at the ceremony to mark the partnership between LankaPay and the Cyber Security Summit, Lanka Clear General Manager/CEO Channa de Silva said that they are indeed delighted to have partnered this year’s Cyber Security Summit as the Official Payment Network. “As the National Payment Network of Sri Lanka, we consider ensuring security in everything we do to be of utmost importance to our member banks and financial institutes as well as the general public,” de Silva said. “Via LankaPay Network and the Certificate Authority (CA), we are providing a vital service to the country’s financial sector by facilitating interbank transactions in a faster, convenient, affordable and a secure manner. Information security is at the heart of our operations and we are indeed proud to be the first entity in the country to obtain the PCI-DSS ver 3.2 certification, which is by far the highest global security standard for the payment card industry. We continuously invest in security to ensure that we are on par with international standards providing the necessary impetus to the country’s financial sector to remain resilient. It is in this light that we find great synergy in partnering at this year’s conference,” he said. Meanwhile, CICRA Group Director/CEO Boshan Dayaratne said that the co-organisers are delighted to have LankaPay, the National Payment Network, as a partner of the summit for the fourth consecutive year. “This year’s summit will be a bigger and better experience with a number of international and local speakers addressing the audience,” Dayaratne said. “The summit will also expose latest flaws in information security that affects the global community including the corporations and the governments. Discussions, demonstrations and presentations will revolve around some of the most malicious attacks and potential threats surrounding the security field,” he said. More details on the summit can be accessed online at: http://cybersecuritysummit.lk/.